For your sensitive ears … Silver Infinity Earrings handcrafted by Christie Leighton Jewelry. The infinity charm is made from Sterling silver wire with a 4mm Bali silver daisy charm. The earring is mounted on a French hook earwire. The earwire itself is made from a base of surgical grade stainless steel and then polished to a mirror shine. Each pair comes with a set of clear plastic earwire stoppers. The stoppers give you confidence of a secure fit so you can wear them without the fear of them falling out. Christie brings to Sensitively Yours a wide variety of handmade artistic designs that have been very much appreciated by our customers. All of her works are designed to display a look of class and charm while also being easy to wear. Most of the styles Christie displays at Sensitively Yours website are from the very same collections she markets in her local craft shows in and around Fort Collins, Colorado. Found nowhere else on the Internet, the Christie Leighton Jewelry is exclusively offered at our site. She creates the most elegant styles that are several notches above most of the hypoallergenic earrings. Silver Infinity Earrings by Christie Leighton Jewelry. Created using a Sterling silver 22mm infinity charm and a 4mm Bali silver daisy charm. The earring hangs from a surgical steel French earwire. 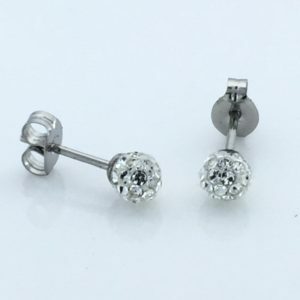 The earring measures approximately 28mm (1 1/4 inch) from the top of the earwire.